PHOENIX - A small plane crashed in the front yard of a northeast Phoenix home and exploded Thursday, killing the pilot who was trapped inside and seriously injuring a passenger. 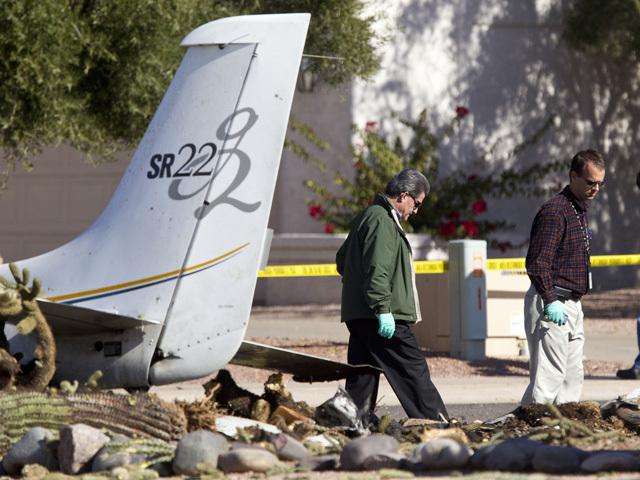 The single-engine plane went down just before 10 a.m., about a half-mile short of the Scottsdale airport runway. The plane missed hitting any homes in the residential area, and no one on the ground was hurt. Police spokesman Sgt. Tommy Thompson said the name of the 62-year-old pilot was pending positive identification from the Maricopa County Medical Examiner's Office. Police did not release the name of the passenger, but said he is 60. A witness told The Associated Press that the plane was flying very low and then crashed near an intersection and burst into flames. "Right when I turned down the street, I saw it just hit the ground in a huge cloud of smoke and the flames," said Jessica Baker, 18, who was on her way to her last day as a student at a nearby beauty school. "And then I got out of my car and sprinted over as fast I could. People were already there helping," she said. "The first guy got out (of the plane), and he was screaming for his friend. His face and shoulder was burnt, noticeably burnt." The second man was trapped in the plane, and people were trying to get to him, she said. "You could hear him screaming for help, and then it exploded again and I literally fell to the floor," Baker said. The plane was on a flight from Show Low, Ariz., to Scottsdale, said Federal Aviation Administration spokesman Ian Gregor. The Cirrus SR22 was built in 2005 and registered to a company in Pinetop, Ariz. The plane did not skid when it hit, apparently pancaking nearly straight down into the yard, with its nose in the street, fire department spokesman Capt. Scott McDonald said. Fire crews from Phoenix and Scottsdale converged on the scene, with Scottsdale crews arriving first, McDonald said. The airplane was completely engulfed in flames, and there was nothing they could do for the man trapped inside. The survivor was talking to rescuers, McDonald said. He was taken to a nearby trauma center with serious injuries, which police called non-life threatening.